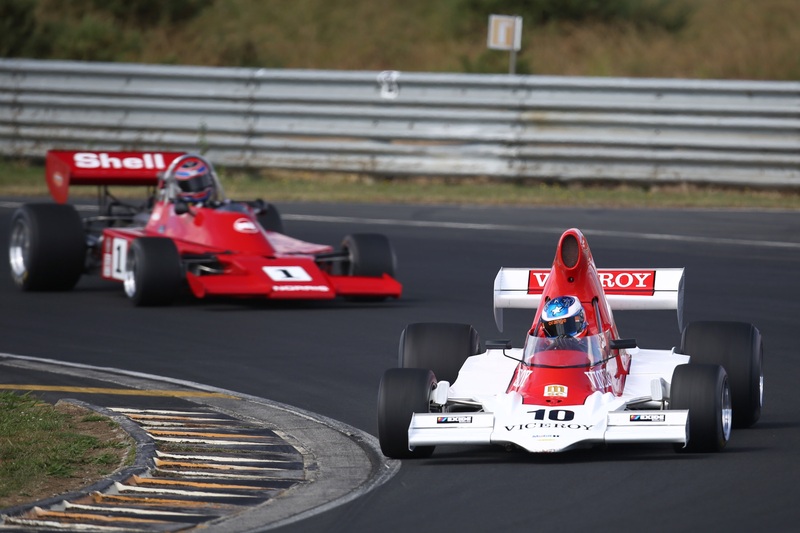 It was the one that got away at the third round of this season’s MSC NZ F5000 Tasman Cup Revival Series at the first Gulf Oil Howden Ganley F5000 Festival historic motor racing meeting at Hampton Downs last week end. Series super-vet Ken Smith (Lola T332), the 73-year who continues to defy the usual stereotypes about age, qualified quickest and won all three MSC F5000 races at the meeting. But though he went quicker in qualifying (59.264) than the 59.483 race record visiting British driver Michael Lyons (Lola T400) set a year ago, circumstances meant Smith was not able to repeat the time in a race, and therefore claim the record. Fortunately, the double-weekend format of the annual NZ Festival of Motor Racing meetings – which this year jointly celebrate NZ F1 driver Howden Ganley and the F5000 category – means that Smith has another opportunity this weekend. And speaking this morning he said he is going to make the most of it. “There’s a 58 – a mid 58 – in that car, no doubt about it,” Smith said of the ex Danny Ongais Lola T332 bought four years ago now from the United States and brought back to front-running race condition by long-time crew chief and part-owner Barry Miller. Fellow front row starter from last weekend, Clark Proctor (March 73A/1), and two-time former series champ Steve Ross (McRae GM1) will be back to keep Smith honest this weekend, with visiting Australian driver Paul Zazryn (Lola T332) and Greg Thornton (Chevron B24/28 or Surtees TS8) from Great Britain vying for best visiting overseas visitor honours. The MSC field will be down a little on its grid-busting 26 cars from last weekend, with former series champ Ian Clements (Lola T332) and fellow Christchurch competitor Lindsay O’Donnell (Begg FM5) missing the round because of work commitments, and Glenn Richards (Lola T400), Warwick Mortimer (Surtees TS5) and Tim Rush (McLaren M22) expected to be out for the rest of the season after a multi-car crash in the feature race on Sunday. Rotorua driver Brett Willis (Lola T330) was also involved in that incident but series coordinator Tony Jack says Willis and his family-based team is pulling out all the stops to have the car repaired in time. Defending series champion Andrew Higgins (Lola T400) is also hopeful of having his car back on track after an engine problem last Sunday.